Defensive backs have the most variability in point production from year-to-year. In other words, your top 20 defensive backs in 2013 could be quite different from your top 20 defensive backs in 2012 (especially in big play leagues). Much of this variability is because many times a defensive back's production is heavily tied to the performance of that specific team's front seven. Their production is also heavily tied to how they are used in the defensive scheme (especially safeties). In addition, the defensive back position, more than any other position, typically has top-notch fantasy producers available on the waiver wire. 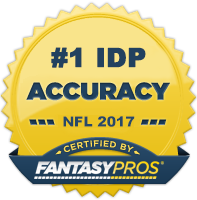 This is due to the relatively large amount of DBs that unexpectedly emerge as viable fantasy options throughout the course of the season (e.g. Tim Jennings, Harrison Smith). With this being said, I find it hard to use one of my first defensive picks on a defensive back. In reality, there are very few "locks" at the fantasy DB position. Therefore, I usually try to grab a solid veteran fantasy producer like SS Bernard Pollard or FS Eric Weddle and get riskier at this position with my later picks. This strategy affords me the luxury of using higher draft picks on other defensive positions where their projected performance is more accurately predicted.